Running a marathon in all 50 states by the time I am 35. I also want to run a sub-1:10 half-marathon in a few years and a sub-2:30 full-marathon. I’m big on goal-setting. I also like to stay in good shape. 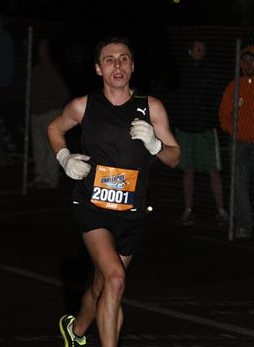 During the 2011 NYC Marathon, I almost missed the start of the race. I was scheduled to ride a bus down to NYC but the bus met runners in a different spot than was advertised. I ended up driving from my home to NYC, found a parking spot, took a taxi to the Staten Island Ferry, crossed the Hudson River to Staten Island, and then sprinted 3 miles to the start line. I barely made the start of the race, with 0 time to spare. It ended up becoming a 29 mile race, and I ran a 2:58. I laughed about it with my friends and family afterward. I like to bring others through to Boston and help them achieve a PR. It’s also great to meet people from around the country. There was an older gentleman who wished to run a 3:30 marathon in Disneyworld. He had tried for many years to run that time, but had failed each time (although he informed me that he was within minutes every single time). We worked together, and I helped him to run a 3:29:50. He ran faster than his goal and qualified for the Boston Marathon in the process. He was so excited!!! I like to think that I am funny. I promise you’ll have a good time. Let me do all the work and just stick with me, I’ll help you get a PR or get you into Boston. Do those long runs! Grab some water/sports drink at each stop. And TURN OFF THE GARMIN! I strongly discourage garmins. I am always right on the money! 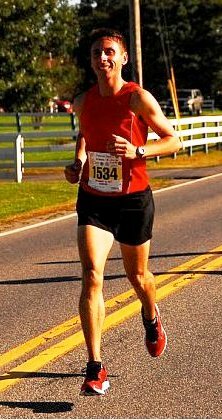 I’ve completed 16 marathons, close to 50 half-marathons, 1 ultra-marathon, and 2 ultra-marathon relays. My main talents are music-related, so whenever I can perform for people I will. You may catch me singing during the marathon.